The mission of Good News Christian Gifts is to develop and offer fun, interactive teaching tools for children that parents, families, churches and children’s ministry programs can use to help further that child’s knowledge of God and His saving work in history. Our prayer is this will deepen his or her relationship with Him. 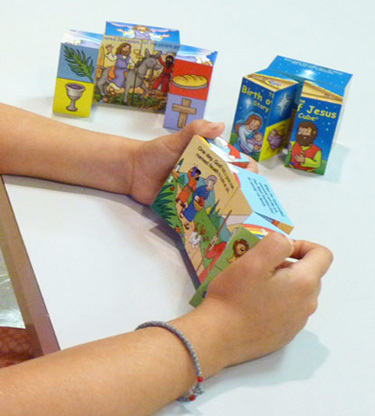 Our dear friend and mentor, Jack Hamilton, of Good News Gifts, developed our primary teaching tool, the Story Cube. The name of our company is both a reflection of our devotion to Christ and homage to Jack’s work. Jack has devoted his life to spreading the Good News to families across the country. His humble service to Christ, our Lord, is a constant inspiration to us. Our vision is to expand our line to include more Bible stories such as the Story of Moses and the Lord’s Prayer, more product lines such as board books and sticker books, and hopefully, over time, more materials for a broader age range of children. We are committed to providing you with high-quality items that are accurate to the Bible. We are committed to deepening your relationship with Jesus and with your children. We are committed to serving Him and serving you. That’s our intent and that’s our promise.